Satin stitches are very simple, but they make a very plain edge. If you want something more decorative, consider buttonhole edging. This is probably the most common edging technique – it makes a very finished looking piece. These instructions are for creating a simple square or rectangle perimeter. There are additional instructions for more complex shapes, but I need to be sitting with needle and thread in order to be able to explain it. Note: I’m right-handed, so I work my buttonhole stitches from right to left. If you are left-handed, you may need to work yours from left to right. 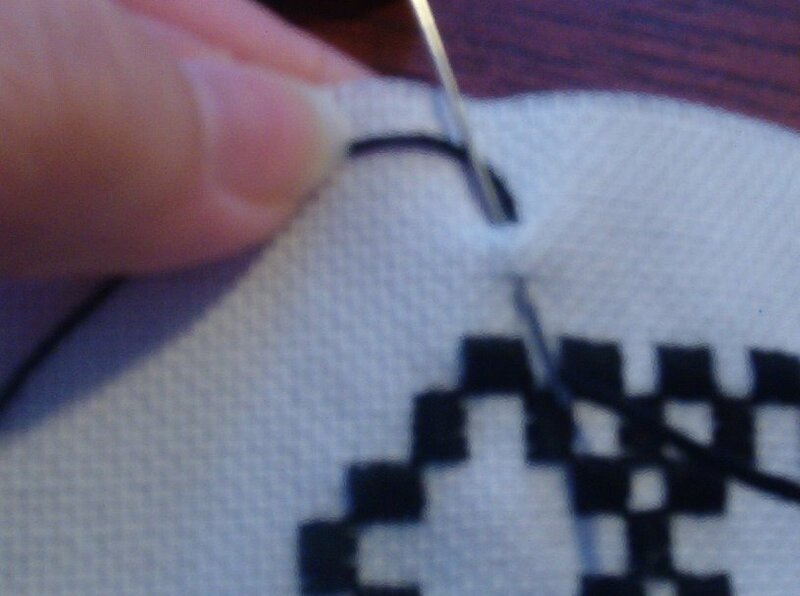 This is a 2-handed stitch, and you’re non-dominant hand determines which way you work. Buttonholes are similar to a satin stitch. They generally cover 4 threads. Begin by bringing your needle up at the “top” of your stitch. Count down 4 threads, and go down through the hole, but do not pull the thread all the way through. Instead, catch a loop with your other hand (I use my thumb – see picture). I then bring my needle up in the top adjacent hole, coming up in the center of my loop. Then I pull taught, and my loop stays on top of my fabric. Then go down 4 threads, catch a loop with your thumb, and come up in the adjacent top hole. Pull taught. Continue this pattern. After a few stitches, you will notice that there is a ridged edge running. That is the basic of creating a buttonhole edge. It’s tricky at first as you’re reading the instructions, but keep trying and it will suddely become easy. Turning a corner is the same as in the satin stitch technique (previous blog post). However, because of the ridged edge, you only need 3 stitches in the corner. Something to note – coming up in the adjacent hole is only until you turn your first corner. I recommend starting at the far edge of the Kloster nearest a corner (see the picture again), so that you are only “off” for a few stitches. This will be fixed when you meet up at the end. Once you have turned the corner, you will be working in a direct line – coming up directly above where your needle went down, which is actually more natural. I find that it’s easier to see what I’m doing when I offset the first few stitches like I described above, and then I make it up on the first corner. It’s also easier to match up the stitches when I finish. Added 4/5/08, after I started buttonhole-ing for the other lesson. Changing threads is a given in this kind of stitching. For buttonhole edging of this kind, change in the middle of a long row (i.e., not a corner). Leave your loop on top of the fabric, unthread your needle, re-thread with a new piece, run under a few stitches and come up in the appropriate hole. Then pull down on the tail of your “old” thread and tuck it behind where your next few stitches will be. Continue buttonhole-ing. When you get back around to your starting point, you will need to “cheat” to make the final edge look finished. You will come up in your starting hole in the middle of your final loop, slip your needle under the top portion of your first stitch, pull taut, then go down in the same “down” hole you started with. You should have a finished, ridged edge running all around the project! I like a buttonhole edge because it gives me a convenient line to follow if I want to use my piece as an applique. I just follow the ridge with my sewing machine! As always, if something is unclear, please post a question in the comments section. You can also check the links section of this page for more information. Thank you so much !!! I couldnt quite get that, and have been waiting for this lesson… wow… pretty simple… 🙂 glad I can now put an edge to my sample… not to mention other pieces too, perhaps!